Informal group portrait of Prisoners of War (POW) artists of the “Gustrow Bing Boys” entertainment troupe at a POW camp at Gustrow, Germany. “The Bing Boys Are Here” was the first of a series of revues which played at the Alhambra Theatre, London during the last two years of the First World War and they are the origin of the name used by the POWs for their production. 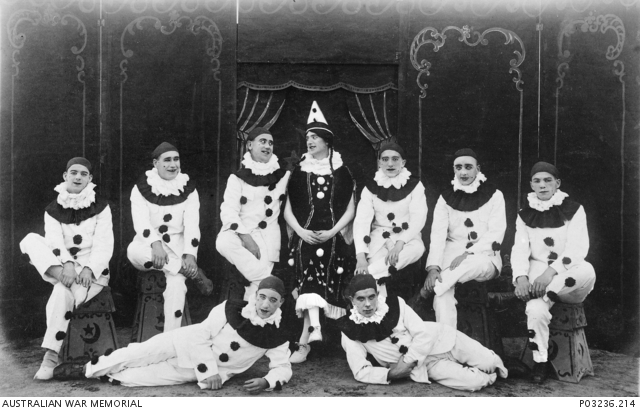 The performers are wearing pierrot costumes. Included in the group are: 1035 Warrant Officer (WO) Archibald Paul Kennedy, Australian Naval and Military Expeditionary Force (AN&MEF) from Sydney, NSW; possibly 13716 Sergeant (Sgt) John Ridge, 8/North Staffordshire Regiment; possibly 22/351 Corporal (Cpl) William Ebdon, Durham Light Infantry; 9363 Private (Pte) Harry J.F. Checketts, 1st Royal Berkshire Regiment (POW since at least 1915); Cpl W Brooks; Cpl F Smith; 126593 Pte Albert Louis Pruden, Royal Army Medical Corps; 6271 Cpl William Hamilton, 36th Battalion, from Manjimup, Western Australia; 596 Cpl Harold le Plastrier Jackson, AN&MEF, from Coburg, Victoria. WO Kennedy enlisted at the age of 28 on 11 December 1916 and embarked for overseas on 20 December 1916 aboard SS Matunga. He was taken as a POW on 6 August 1917 off New Guinea, when SS Matunga was captured by the German raider Wolf and was held as a POW in Germany until repatriated to England on 9 January 1919. WO Kennedy arrived back in Australia on 21 May 1919. Cpl Hamilton enlisted at the age of 29 on 3 April 1916 and embarked for overseas on 30 October 1916 aboard HMAT Suffolk. He was captured on 11 April 1917 at Riencourt, France, and held as a POW until repatriated to England on 30 December 1918. Cpl Hamilton arrived back in Australia on 2 August 1919. Cpl Jackson enlisted at the age of 24 on 2 October 1916 and embarked for overseas on 27 July 1917 aboard SS Matunga. He was also taken as a POW on 6 August 1917 off New Guinea, when SS Matunga was captured by the German raider Wolf and was held as a POW in Germany until repatriated to England on 31 December 1918. Cpl Jackson arrived back in Australia on 16 June 1919. One of a series of over 400 photographs sent by Australian POWs in German camps to Miss M. E. Chomley, Secretary, Prisoners Department, Australian-British Red Cross Society, London. Original album housed in AWM Research Centre at RC00864, Album image number 257. 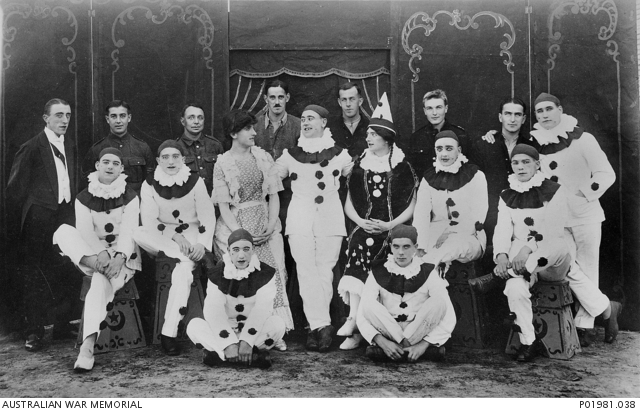 Informal group portrait of Prisoners of War (POW) artists and committee members of the ‘Gustrow Bing Boys’ entertainment troupe at a POW camp at Gustrow, Germany. ‘The Bing Boys Are Here’ was the first of a series of revues which played at the Alhambra Theatre, London during the last two years of World War I and they are the origin of the name used by the POWs for their production. 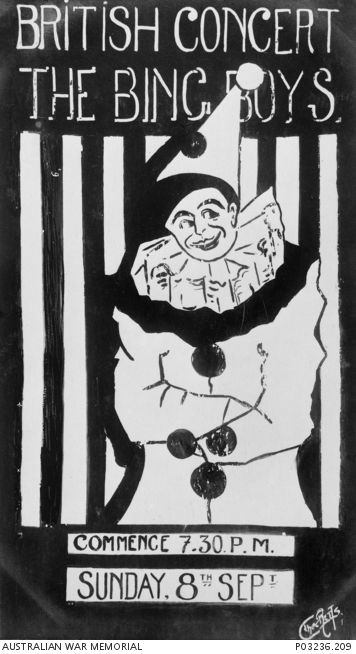 Most of the performers are wearing pierrot costumes. Identified on the far left in the back row is possibly 9363 Private (Pte) Harry J. F. Checketts, 1st Royal Berkshire Regiment, committee member and participant (POW since at least 1915); fourth from the left in the back row is 2201 Pte David B. Pryde, 1/London Scottish Regiment; firth from the left in the back row is 1035 Warrant Officer (WO) Archibald Paul Kennedy, Australian Naval and Military Expeditionary Force (AN&MEF) from Sydney, NSW, captured 6 August 1917 off New Guinea, onboard SS Matunga; and third from the left in the front row (dressed as a woman) is possibly 13716 Sergeant (Sgt) John Ridge, 8/North Staffordshire Regiment, committee member and participant. Also included in the group but not identified, are: 4424 Sergeant (Sgt) John Henry Jones, 14th Battalion, from Bendigo, Victoria, captured 11 April 1917 at Riencourt, France, committee member; Sgt Richardson, committee member; possibly 22/351 Corporal (Cpl) William Ebdon, Durham Light Infantry, committee member, arranger, producer and participant; 510101 Pte Harold Charles Phelps, 1/14th London Regiment (London Scottish), captured 31st October 1914 at Messines Ridge, committee member; Georges Melik, Belgian, conductor of the camp orchestra; Cpl W Brooks, participant; Cpl F Smith, participant; 126593 Pte Albert Louis Pruden, Royal Army Medical Corps, participant; 6271 Cpl William Hamilton, 36th Battalion, from Manjimup, Western Australia, captured 11 April 1917 at Riencourt, participant; 596 Cpl Harold le Plastrier Jackson, AN&MEF, from Coburg, Victoria, captured 6 August 1917 off New Guinea, onboard SS Matunga, participant; Cpl A. Markham, pianist; possibly Sgt James Hamill, Royal Field Artillery, stage carpenter; Pte P Carroll, costumes, another long term inmate of Gustrow; Giot, probably Belgian, stage lighting; Michiels, probably Belgian, stage lighting. One of a series of over 400 photographs sent by Australian POWs in German camps to Miss M. E. Chomley, Secretary, Prisoners Department, Australian-British Red Cross Society, London. Original album housed in AWM Research Centre at RC00864, Album image number 256. Theatrical billboard advertising the “Bing Boys”, a Prisoner of War (POW) entertainment troupe production held on 8 September 1918 at the POW camp at Gustrow, Germany. “The Bing Boys Are Here” was the first of a series of revues which played at the Alhambra Theatre, London during the last two years of World War I and these revues are probably the inspiration for the name used by the POWs for their production. One of a series of over 400 photographs sent by Australian POWs in German camps to Miss M. E. Chomley, Secretary, Prisoners Department, Australian-British Red Cross Society, London. Original album housed in AWM Research Centre at RC00864, Album image number 249.